It’s race day and the fancy pink gorilla takes off in front of you while blaring his signature trombone. You’re wearing a cape and it’s flapping in the wind behind you as you race to win that free green beer. It feels good to be a hero, right? When the race is over, don’t hang up the cape until next year, instead come to the Animal Rescue League of Iowa, because we need heroes . . . thousands of pets need a hero. Our heroes are volunteers who sit outside a shy dog’s kennel for hours to slowly get them used to being around people. Our heroes are foster volunteers who bottle feed one-week-old kittens every 2 hours around the clock because they were separated from their mother. Our heroes are staff and volunteers that come in at 5 am on holidays to care for the pets, even though they also have plans with their family and friends. Our heroes are individuals and families who come to the ARL and adopt a new pet to join their family and give them a second chance. Our heroes are donors who financially support our work and believe in our mission to change lives. 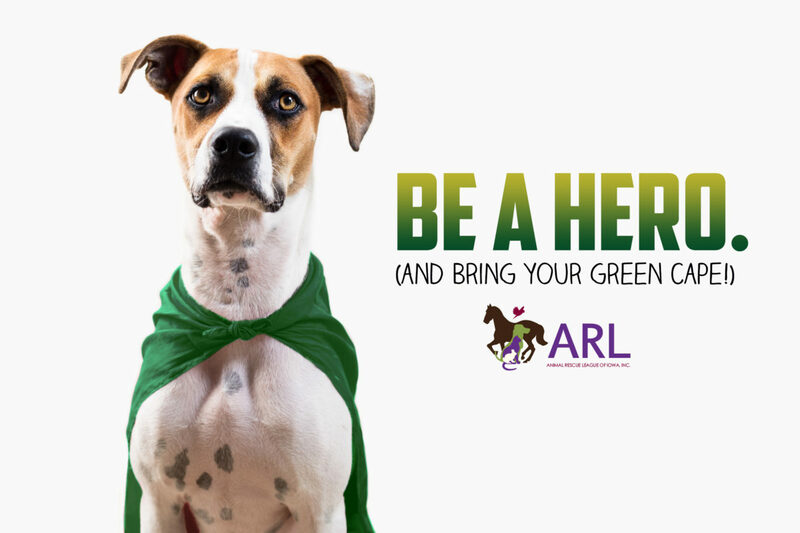 There are so many ways that you can be a hero at the ARL – we need you – the pets need you.